Timothy A. Peterson, MD, MBA, is the ACO Executive of the Physician Organization of Michigan Accountable Care Organization (POMACO) at the University of Michigan Health System. The POMACO project brings providers and hospitals together to coordinate the care for a specific population, while improving quality outcomes and reducing costs. He is responsible for the executive leadership of POMACO; working collaboratively with the Board of Managers to set the clinical strategy and leading the team necessary to implement that strategy across our member institutions spanning the state of Michigan. Dr. Peterson also serves as the Interim Medical Director for Population Health and Interim Executive Director, Home Care Services; overseeing the strategic redevelopment and management of these business units. Dr. Peterson is also an Assistant Professor of Emergency Medicine at the University of Michigan Health System. He received his BA in Microbiology with a minor in Management and Organizational Behavior. He then obtained his MD from the University of Cincinnati College of Medicine and completed his Emergency Medicine Residency at the University of Michigan Medical School, where he also served as chief resident. Afterward he studied at the Stephen M. Ross School of Business at the University of Michigan and received a Masters of Business Administration. While seeing patients in the ambulatory setting, he is also active in teaching medical students, house officers and fellows. His research interests include Healthcare Finance and Operations Management and focuses on reducing costs, increasing quality, and improving the patient experience. He is active in a multitude of institutional committees and is board certified with the American Board of Emergency Medicine (ABEM). 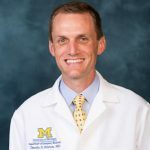 In recognition of his contributions to the field of Emergency Medicine, he was elected to the American College of Emergency Physicians (ACEP) as a fellow and is certified in Lean Health Care through the University of Michigan, Department of Engineering. He was awarded the Golden Apple Award for the most effective clinical educator for the 2010 academic year by the Emergency Medicine Residents. In 2008 he received the Stephen C. Dronan Professionalism Award for demonstrating consistent commitment to the highest standards of the medical profession.